Invicta FC featherweight champion Cris “Cyborg” Justino dropped the gauntlet Friday night by notifying UFC bantamweight champ Ronda Rousey that she will defy her doctor and shed the weight required to face Rousey at 135 pounds. That’s a significant concession on Justino’s part, though there are still a few hurdles that need to be cleared before the biggest brawl in women’s MMA can be arranged. Nonetheless, it’s now in UFC president Dana White’s hands to put together the fight every fan wants to see – something he’s always prided himself in doing. After Rousey TKO’d Sara McMann Saturday at UFC 170 to post her third straight title defense, White was asked if the fantasy fight could now come to fruition. White was clearly open to the idea. However, he’s not about to draw up bout agreements tonight for a scrap that could happen 10 months from now when there are so many unanswered questions. In Friday’s statement, Justino said she would compete at 145 pounds in March for Lion Fight’s muay Thai title. She planned on defending her Invicta featherweight throne in May. The Brazilian would then challenge for Invicta’s bantamweight belt this summer. 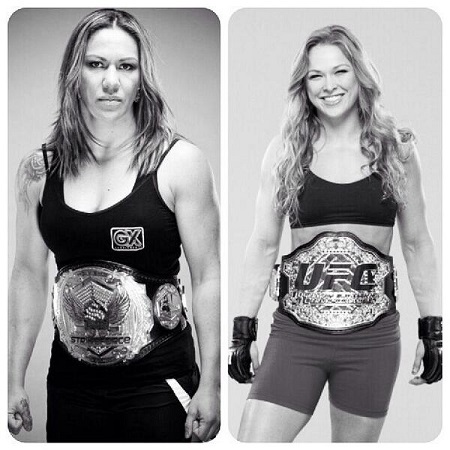 After presumably capturing that crown, Justino would jump to the UFC and meet Rousey in December. A confident Justino then claimed she would grant Rousey an immediate rematch to prove it wasn’t luck that she steamrolled “Rowdy” for her hardware. “OK, I’m on it,” White sarcastically responded when told of Justino’s schedule. “I just said, she’s gotta fight. She’s gotta make weight a few times and she’s gotta fight. We’ll see what happens. As far as Rousey is concerned, Justino knows where to find her. BTW, Justino also voluntarily offered to undergo drug testing every week leading up to a tango with Rousey.